Home | Bird Supplies | Bird Perches | Booda Comfy Bird Perches | Booda Comfy Perch Large 28"
Home | Bird Supplies | Bird Perches | Booda Comfy Perch Large 28"
Product Reviews for Booda Comfy Perch Large 28"
Booda Comfy Perch Large 28"5Diana S.May 9, 2016I cannot say enough good things about these perches. All my fids have them, and I love that they can be shaped to make different perching options around the cage. Booda Comfy Perch Large 28"5Cathy BodhaineJanuary 23, 2013The favorite perch for my three parrots is the comfy perch. They also love to chew them. 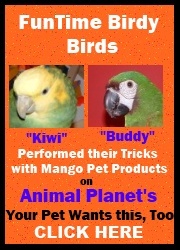 It helps keep them from being bored and satisfies the chewing that birds need so much. When my birds are in their hormonal time of the year they pick at their comfy perches even more. It keeps them busy. Booda Comfy Perch Large 28"4susanMay 9, 2011it's a great perch, especially as a roosting perch. it's really too large for a congo african grey and i would recommend the large size for cookatoos and macaws. next time i'll get the medium.